Picture taken on October 16, 2013 shows an empty space left by a painting from French artist Henri Matisse that was stolen at the Kunsthal museum in Rotterdam. Experts are analysing ash found in the house of a Romanian suspect charged over the spectacular October theft of seven masterpieces from the Dutch museum, judicial sources said on May 29, 2013. Investigators fear that the suspects burnt the paintings when they realized they could not sell them. 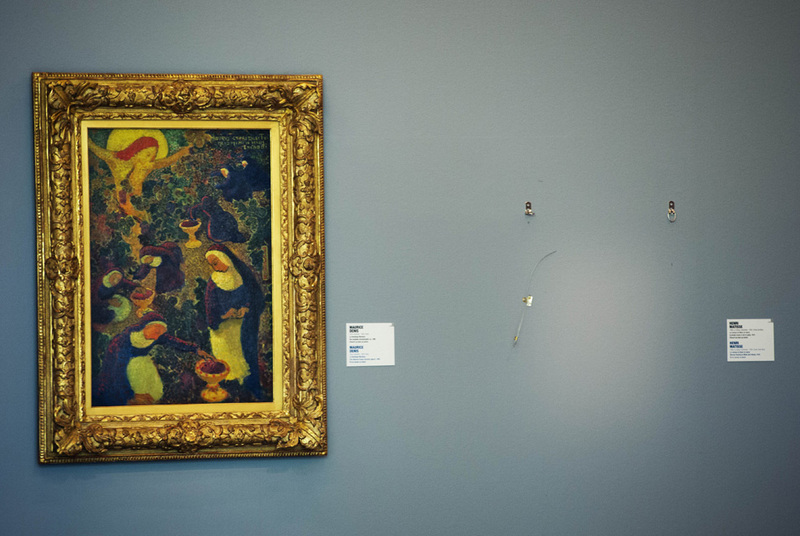 Six Romanians have been charged in connection with the theft of seven paintings by artists including Paul Gauguin, Henri Matisse, Claude Monet and Pablo Picasso from Rotterdam's Kunsthal museum. AFP PHOTO / ANP / ROBIN UTRECHT. BUCHAREST (AFP).- Investigators are analysing ashes found in the house of a Romanian suspect charged for the spectacular Dutch museum heist, judicial sources said Wednesday, raising fears that the seven stolen masterpieces may have been burnt. "Tests are underway, they will take some time," Gabriela Neagu, a spokeswoman for the Romanian prosecutor's office, told AFP. "The ash tests are a stage in the ongoing probe, investigators have to take every hypothesis into account", she added. Investigators fear that the suspects may have set fire to their haul after realising that they could not sell the paintings, which included works by Pablo Picasso, Claude Monet and Henri Matisse. The ashes were taken from the house of Olga Dogaru, mother of one of the suspects and herself charged with "complicity to theft." Her son's lawyer, Doina Lupu, told AFP the tests "were inconclusive" so far. Dogaru was arrested in March after her house in eastern Romania was thoroughly searched. An empty suitcase which had presumably served to store the stolen paintings was unearthed during the operation. Seven Romanians, including Dogaru, have been charged in connection with the theft of the paintings from Rotterdam's Kunsthal museum on October 16. Experts have estimated their value at more than 100 million euros ($130 million). The heist gripped the Netherlands and the art world as police struggled to solve the crime, despite putting 25 officers on the case. The works stolen include Picasso's "Tete d'Arlequin", Monet's "Waterloo Bridge" and Lucian Freud's "Woman with Eyes Closed".